Times Fri,Sat, Sun, 12-6 & by appt. 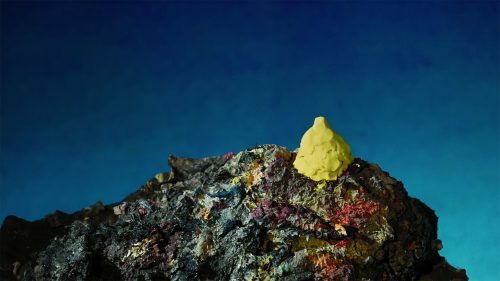 Coleman Project Space is proud to present, ‘Cosmic Laziness’, an exhibition of new works by London-based painter Tim Renshaw and a film installation by Swiss artist Klodin Erb. Klodin Erb lives and works in Zurich, Switzerland, and has exhibited at home and internationally. Her work features in many collections worldwide. 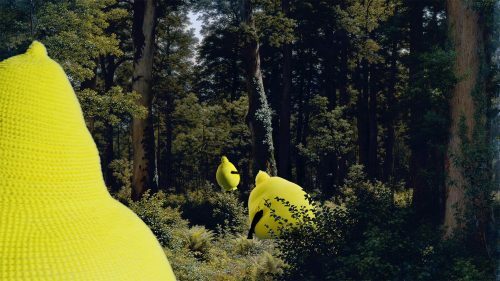 Recent exhibitions include: 2018, Die Wolfslaterne, Kunsthaus Pasquart, Bienne, Switzerland (catalogue), With Other Eyes, Lullin + Ferrari, Zurich, Switzerland, Ein langer Tag, Helvetia Art Foyer, Basel, Switzerland; 2017, Yellow Creature. Aspekte der Transformation, Kunstmuseum Luzern, Lucerne, Switzerland, The Show Must Go On, Kunstmuseum Bern, Berne, Switzerland (online catalogue); Die Augen der Bilder – Portraits from Fragonard to Dumas, Museum Langmatt, Baden, Switzerland (catalogue); 2014 Docking Station, Aargauer Kunsthaus, Aarau, Switzerland (exhibition app) and Armory Presents, with Rotwand, at the Armory Show, New York in 2013. Even the empty page provides evidence of materiality and of human choices. Its having been manufactured, into a rectangular form, the compression of fibres to make it into a physical thing, the obvious and forensic evidence of mechanical and human handling, and how it might resonate in the mind as a metaphor for possibility. This is all before it becomes the basis for ‘something’. The essential surface is ascribed different jobs at different times. Context is, of course, everything. A shopping list in a given moment is of more use than the algebraic scribblings of a brilliant scientific mind. A Dear John might hold all the emotional cards over a beautifully described map, unless that place becomes absolutely necessary to visit; the last known site of a deceased loved-one’s hand in a Christmas card more valuable to a particular individual than any first edition. The page in art is often a place of planning and thinking; of sketch books, whether politely marked or rammed to the point of permanent openness by things adhered to its innards; and of neatly lined words in extraordinary combinations that might collectively inform a bid to make sense of some unknow territory or dimensional plane. It provides both the start and the end of a process. A two-faced world of complex layers. As the book is made object by the amalgamation of pages, so the painting is often brought to completion by the addition of many material skins. 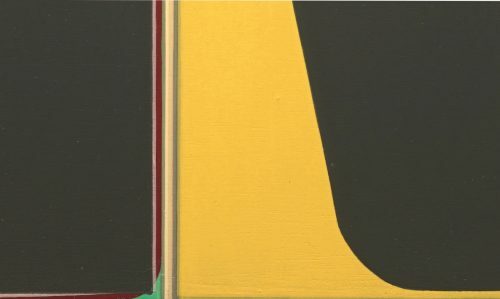 Both, in the case of Tim Renshaw’s research and output, are defined by edges – sharp enough to cut and yet individually vulnerable to very ordinary pressures. Architecture, or what Renshaw describes as “paper architecture” – the sketches, proposals, paintings, photos, plans and other two-dimensional sources for the particular details he references – often provides the starting point for each composition. His preoccupation with the page is not a new thing, therefore, but the latest notebook works consolidate his interests through evermore minimal means. When I visit Renshaw in the studio he has a photograph of a Le Corbusier building, photocopied from a book and pinned up on the wall above his palette. Other examples, spanning early Renaissance to the Modern era, might include: details of walls and partitions in paintings by Giotto or Lorenzetti; the proportions of the columns as described in the writings of Alberti; coloured-glass designs in the watercolours of Bruno Taut; and Virilio or Parent’s plans for oblique architecture. “They are all based on the use of simple geometric and planar forms, and feature a strong and binding outline,” he explains. In the new works we are presented with a pair of pages, but also the suggestion of a number of hidden leaves or layers. It’s this quality Renshaw finds most compelling about his chosen sources; the idea that an image constructed with logic and clarity in mind at one point in time might harbour allusions to other less tangible surfaces in another. We talk about light and how it alters perceptions of materiality and mass, and how a building retains a sense of the two-dimensionality of the plans. “The surface of a building is like a drawing,” he says. Over and again, the viewer is, quite literally, taken to an edge. As the title of this exhibition, ‘Cosmic Laziness’*, implies, the edge here might imply the end of everything or simply a perfunctory demarcation resulting from an arbitrary decision. Vestiges of real, planned-for, or possibly imagined structures sit atop coloured grounds designed to allude any single notion of being set in the pop-cultural present. Then and now sit oddly together, coloured swatches overlapping like the hemmed lines of multiple garments. Renshaw’s edges, of potential other images deliberately, expertly, but only ever partially exposed, provide the sense of another place to move on to and the possibility of existing stories ruminating beneath. Associatively they take us forward and back, the sense of movement connecting the factory-set processes in the construction of notebooks with the maker’s arm as it draws lines and fills in forms across each plate of metal. It’s an important part of the seduction, this ordered sense of imperfection – a means of bringing us to, but never quite into, the surface. The experience is a little like being pulled in for an embrace, only to be held an inch from touching for the purposes of close scrutiny. These works might have been created with any of the contemporary paraphernalia that enable the physical erasure of the artist in the process to varying degrees, but they haven’t. While some of the spaces and structures in reference, were they to be envisioned or made today, would undoubtedly be engineered (if not first imagined) onscreen – Autocad’d or Google Sketch’d into existence. It’s Renshaw’s firmly analog and entirely hand-made commitment to precision that holds the attention and keeps questions about how and why he might have made them in constant play. 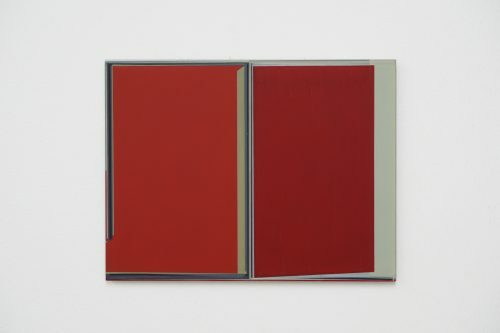 Where many artists reproduce ideas from their sketchbooks, onto surfaces or translate them into objects through materials, here, Renshaw appears to draw from the experience of thumbing through notebooks themselves. There is certainly a sense of recycling about the new, comparatively stripped-out images. They appear as if paintings of pages that might have already been painted, or had another existence of sorts. They could not, therefore, be described as blank or void of content, but certain compositions are spare enough to induce the anxiety of the ’empty’ page, space, or even screen, like many great abstract paintings. At first spec, they resemble technically focused meditations on chromatic relationships, but as the eye moves edge-to-edge, so the image-object shift comes into play. It’s really quite a subtle shift and requires some work on the part of the beholder. And, for me, Renshaw’s strength lies here, in his ability to pull us, if we’re willing to travel, between the many layers and modes of reproduction to reveal the hidden designs of familiar things. * The expression was first used by German sociologist and philosopher Georg Simmel in the late 1900s to describe an optimum state of equilibrium or harmony. ** I’m thinking of a National Gallery encounter with a Malevich black square in ‘Monochrome: Painting in Black and White’. Of finding its linearity, by today’s masking-taped or digitally-generated standards, distinctly fuzzy, not to mention the evidence of scuffs and smears as a result of decades on the road. After years of only viewing this work in perfect reproduction, it felt like a necessary reminder of the painter at the end of the process; a telescopic moment that temporarily flattened the space between the theory of what artists do and the messy human business of being in the studio.